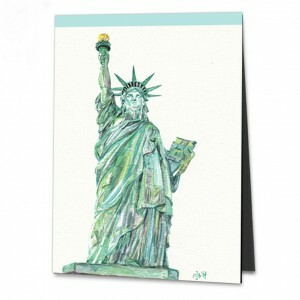 The Statue of Liberty is probably New York’s best-known landmark. It stands for the USA, for freedom and democracy – and the hope of millions of immigrants for a better life. Today it is merely of historical importance and is a sight for tourists from all over the world. To paint it, I travelled to New York with my husband Klaus. I didn’t think we’d see Ingvald again. But as luck would have it, our paths crossed again on the day of our departure. He hardly seemed surprised but was delighted when we suddenly faced each other in the crowd in front of the UN headquarters. “You know, I've actually started painting,” he immediately buzzed, pulling out an A4 sketchbook from his shoulder bag. Right from the start I liked the quick, clear line of his detailed settings. “My very first picture is the best,” Ingvald announced proudly. It was the Statue of Liberty amid a colourful crowd. It looked neither friendly and benevolent as in photos, nor serious and determined as in my watercolour, but shone at the viewer with a wink. “And these three down here – that’s us.” Unmistakable. Later, high above the clouds, the images of the past few days went through my mind. The Statue of Liberty. “Freedom is not bound to any place. It is above all a matter of consciousness.” These words of my friend Eva came to my mind as I looked out the window into the pitch-black long night with its distant starry twinkles. Freedom – I thought, is something you can feel. In places, in other people and in yourself. It has an infinite number of facets and is always comforting. Like that moment on the plane with that clear view into these untouchable realms.